Not available for weddings, large events or one-night bookings. This property does not have air conditioning, but is on the water. Because of the tight knit neighborhood, a maximum of eight (8) people are allowed at this property at any given time, this includes overnight and daytime guests/visitors. 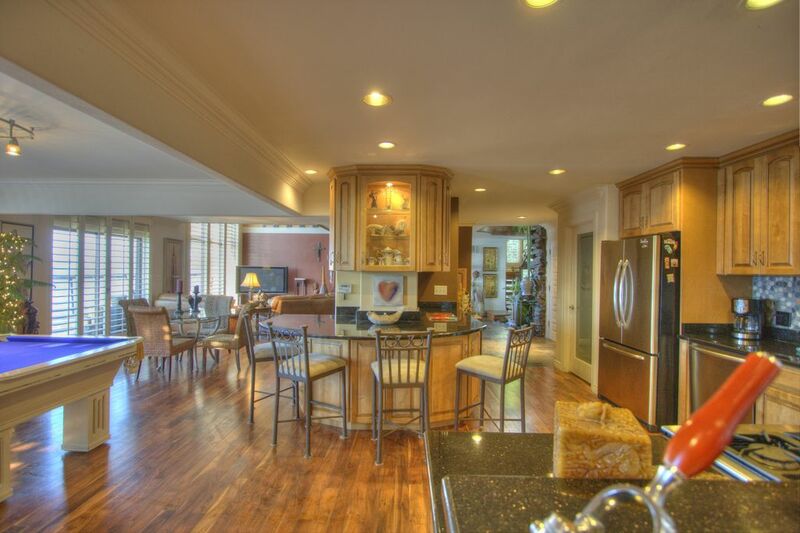 The House: Del Mar Water’s Edge is a two story 5 bedroom 3 bathroom house on Puget Sound. Walk across a pond to the front entrance and inside to the two story rock garden with planted bamboo and banana plants. A chef’s kitchen, pool table and living room wrap around the black stone wood burning fireplace. Step onto the large entertainment deck framing the estate’s 100’ of private white sand/crushed shell saltwater beach. Enjoy a jacuzzi, BBQ, or just relax watching the bay and mountains in the distance. The property includes two kayaks and patio lounge seating. Even though the house is a large 5 bedroom, we have found that a group no larger than 8 works nicely for the house's water restrictions. This house is on septic and is right on the water on Rocky Point. Specific information about water usage is in the booklet at the house at time of check-in. This property sleeps a maximum of 8 guests. This house does accept dogs. The master bedroom has a private entrance to the deck and private indoor sauna. The second bedroom is a second master suite with bathroom and private lanai. The 3rd and 4th bedrooms each have a queen bed. The 5th bedroom has two queen beds. A hall bathroom and hall lounge area service these rooms. The Garden: Water’s Edge shares a quiet lane with other waterfront homes. The private driveway has parking for up to 4 cars. Fir trees bamboo and zen inspired landscape graces the garden. The Neighborhood: This zen get-a-way is located in Bremerton's Rocky Point neighborhood. The area is quiet and established with waterfront and water view homes. Grocery stores, services, and Starbucks are a 10 minute drive away. A 10 minute drive to the Bremerton Ferry gets you to Downtown Seattle. Drive through Gig Harbor and Tacoma to Seattle, about an hour and 15 minutes. Two bathrooms have shower, third bathroom has tub shower combination. White sand/crushed shell beach in front of house. Deck goes right over the water. Love this place, can’t wait to go back! It had everything we needed and then some. Even kayaks and a hot tub! Will definitely be booking again. House and location on the water is even better than it looks in the pictures. Perfect for our group of 8 for a getaway weekend. Hot tub on the patio and sauna were great. Plenty of bedroom space. Well stocked kitchen. The views and atmosphere on the water are just amazing. Eclectic decorating lends a unique touch. Upstairs master bedroom is great (with it's own balcony!) but has no door to separate toilet from rest of open bathroom/bedroom. Odd layout, but more of a quirk than an annoyance. Pool table was great to have. We traveled from NY to WA in mid-December to celebrate Christmas with our son and daughter-in-law. They live in Tacoma and I wanted a large home to accommodate a group of us comfortably. I knew I found it when I came across this house on VRBO. The house was decorated beautifully for Christmas, complete with a Christmas tree, decorations and Christmas lights inside and outside. We walked into a warm, festive, welcoming home. A bottle of wine and chocolates, along with a welcome note, awaited us...nice touch! The house is lovely with a Japanese Zen vibe and interesting decor throughout. The views were amazing from almost every room. The house is literally right on the water, at times the water went right under the large deck. We were a group of 8 plus our son's dog, there was plenty of room for everyone. The beds were comfortable, the living room was cozy (you would just melt into the couches!) and the pool table was a plus. There were even a few board games. The large open shower in the upstairs master suite with the rain shower and multiple wall jets was wonderful, we encouraged everyone in the house to use this shower. Showers had to be staggered to ensure you had hot water but no big deal. We cooked all our meals at the house during our stay. The kitchen was pretty well equipped, however, a few items such as sharper knives, placemats or table cloths and some trivets to protect their tables would be a suggestion. Another thought for the owners would be to install a coat rack or hooks. There was no coat closet so 8 of us had our coats draped over the chairs or couches. I thought there was be a perfect spot for a row of hooks along the wall as you enter the pantry/laundry room off the kitchen. This would allow easy access to the coats as you stepped out several times a day to the deck and would get all the coats out of the living space. Again this was not a big deal but just an a suggestion for the owners to consider. To our surprise, we happen to be there during the weekend when there was a boat parade with about 15 or 20 boats all lit up and decorated for Christmas passing right outside our back door. We even saw an otter or two in the distance. The house manager, Warren, was very helpful before our arrival and during our stay. He was quick to answer questions and help with any requests. This is a great house, you will surely enjoy your stay. We definitely made greet memories at Water's Edge! The home has great character! We really enjoyed our stay here and were marveling at the decor and “bones” of the house. Such an interesting place! I didn’t give it 5 stars as it was a little “tired” in places. But we just overlooked that and had a grand time!! Beautiful house and relaxing setting. Just a little over an hours drive from South King County this house was the perfect setting for a quick getaway with friends and family. Loved the layout of the bedrooms and the kitchen had everything we needed to make meals and an easy task. Look forward to booking again during the summer months so we can enjoy the beach. We loved this place. We woke up in the morning and watched an otter swim around the shore. We played darts and pool. The hot tub was perfect in the evenings. The kitchen was well stocked with dishes and it was stunning. The bedrooms were spacious and more than comfortable. We all had to use the shower in the master bath, it was amazing.